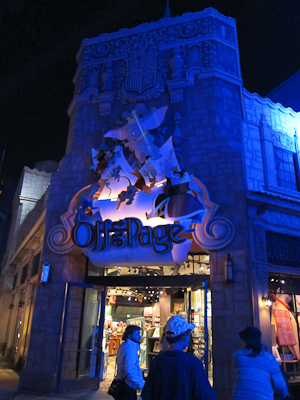 I have to say, my favorite store at the Mouse-Next-Door is Off the Page. 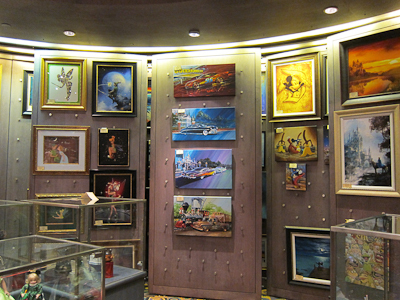 I mean, a whole store dedicated to Disney art? Awesome. 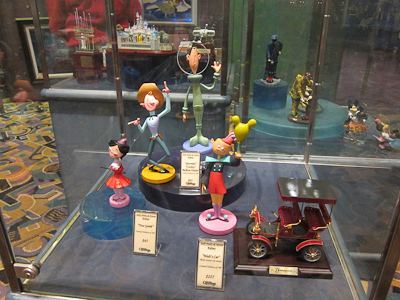 First off, they still have the Mary Blair merch that I was afraid went away with the Mary Blair exhibit at the Gallery. But here's my thing--why do they make these t-shirts so dang small??? It's like an XL is equivalent to a S in normal stores. I’m still thinking of the teapot and a mug. What do you think? I mean, we don’t drink coffee or tea, really, but who doesn’t want a “Guten Tag” mug? Okay, probably a lot of people, but I’m not one of them. There’s great art on the ceiling. Characters are depicted as falling off the page. However, it does make for a rather weird picture. 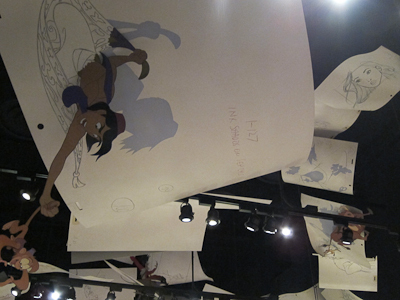 I mean this one looks like Aladdin is throwing himself to the floor or something. Have I mentioned how darned excited I am about Cars Land? I mean in the last three seconds? I can’t wait to share it with you all! Here’s some Cars Land art. Mater and train? Pretty much Theo's idea of awesome. 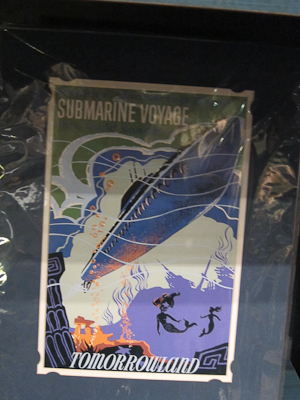 What I really love are the attraction posters. When an attraction opens, an official poster is made. In fact, we have a Matterhorn ride poster in the hallway (full-sized), and a smaller framed copy of the Dumbo poster in Theo’s room. I just love these. And the cool thing is that you can order ride posters and a number of other works of Disney art right from print on demand. Just find it right here in the computer and order it! True Disneyland fans have ride posters all over their houses. Just sayin’. 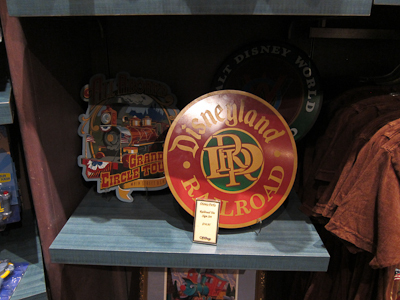 There’s a cool set of tin signs for the Disneyland railroad. 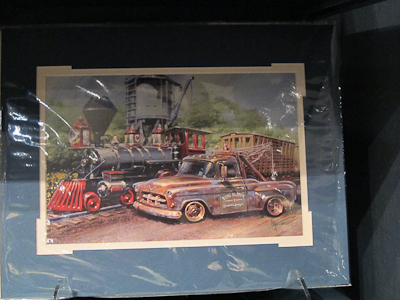 I’m considering getting these for a special someone who loves trains. Kind of blew the surprise there, though. 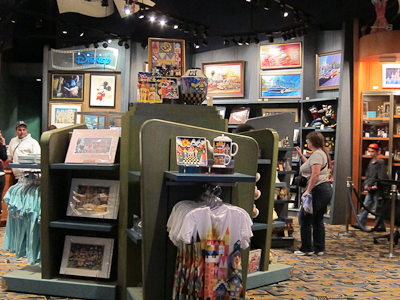 There’s also the Wall O’ Art, with moving panels, to show you the cool stuff you can get. And my favorite part–that actual Real Live Artist! 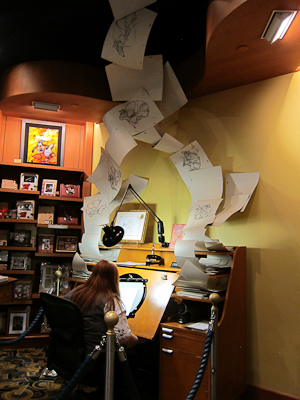 I think it's so cool to see artists at work. 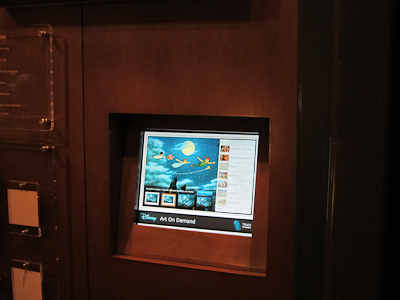 You can sometimes catch them at the watch shop and the Disney Gallery at Disneyland. 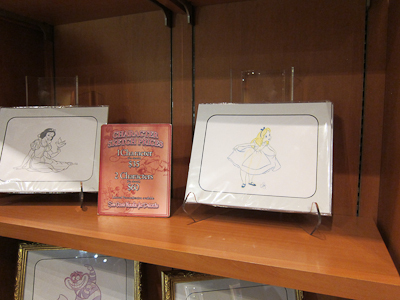 You can buy your very own sketch. So if you’re over in CA Adventure, take a look at Off the Page. It’s a great shop! 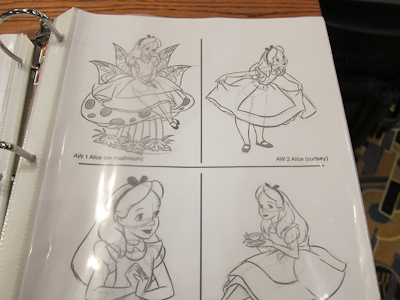 Wait, this is where you go for Mary Blair art? I have got to start spending more time at California Adventure.